Apply the�Fluorescent Cream Stick / Lipstick�and you'll brilliantly glow under black light! This is what Hollywood uses for make up special effects. 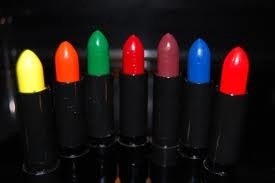 We sell only professional make up. It glides on smoothly and softly, and adheres to lips and skin very well. The bright vibrant colors can't be missed during the day and especially under blacklight!